Following the opening of the headquarters in Venegono Superiore (VA) in 1937, Cev brand was born ( “venegonesi” electromechanical constructions) for the production of on-board instrumentations for aeronautic purposes. In the ‘50s, in Milan, the production of batteries stopped and the production efforts focused on the creation of flashlights and lamps. 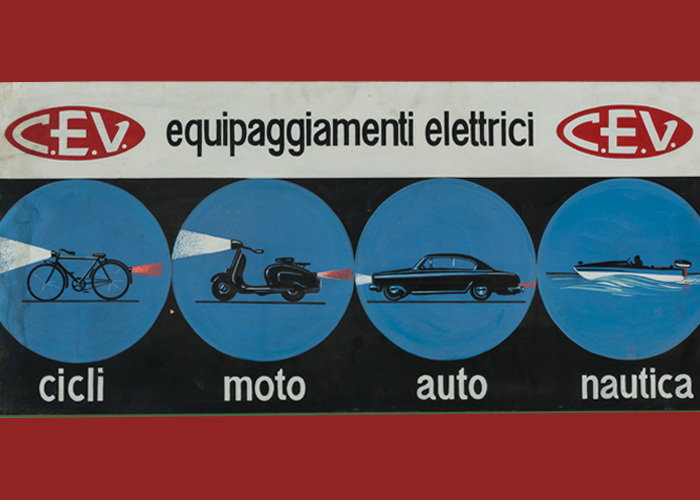 Instead, in Venegono, the production of equipment and headlights went on for motorcycle market. In the ‘70s, Cev company produced mainly for great customers including some international leaders in the batteries and lamps sectors and joined in the distribution process of Italian and foreign large organised distribution networks.